As an intern for the Regenerative Design Group each day is eventful, but mostly excitingly diverse, not knowing where you will be and what you will be doing. On August 6th I was invited to an Ecological Landscaping Association (ELA) event at the Blackstone River Canal in Grafton Massachusetts. You wouldn’t know by driving through the town of Grafton, but a cutting edge, bioremediation laboratory is at work there. 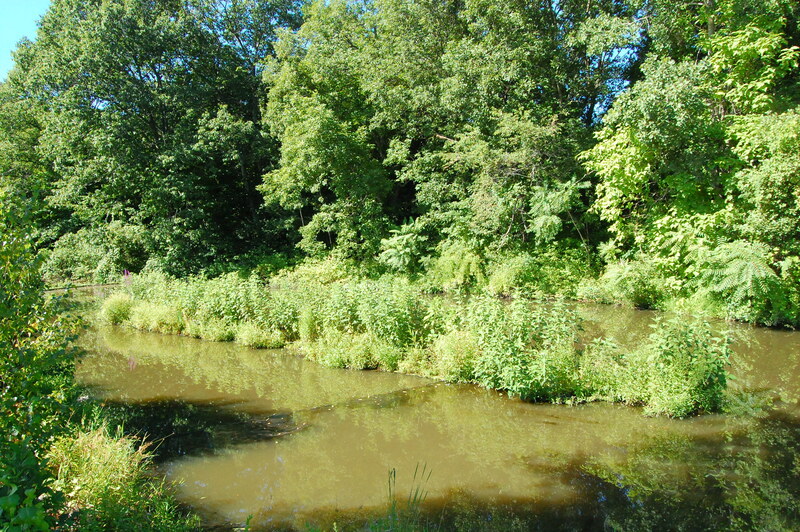 The problem is the pollution of the Blackstone River Canal, which today holds a number of pollutant metals. The number one pollutant being, #6 oil fuel which has continued to seep through the canal walls since the 70’s and most likely long before then. As you approach the laboratory at Mill Villages Park, you begin to see signs of scientific study, when you are greeted by a large greenhouse housing six tanks of water and plant matter of great size and significance. I was fortunate enough to hear Gene Bernat, the project owner and Vice President of Cover Technologies explain the relevance and importance of his project at the Blackstone River Canal. I became deeply immersed in his passion for creating what he and his partner proudly call “The Living Systems Laboratory”. His partner, John Todd founder of John Todd Ecological Design and pioneer in the design of ecological wastewater treatment systems, equally shares Gene’s dedication; and together along with a bright and knowledgeable Civil Engineer-in-training, Max Rome from the University of Massachusetts, explain the three different technologies working to treat the Blackstone River Canal. Bioremediation is a desirable, and ecological alternative to the old method of removing pollutants and waste from the ground. 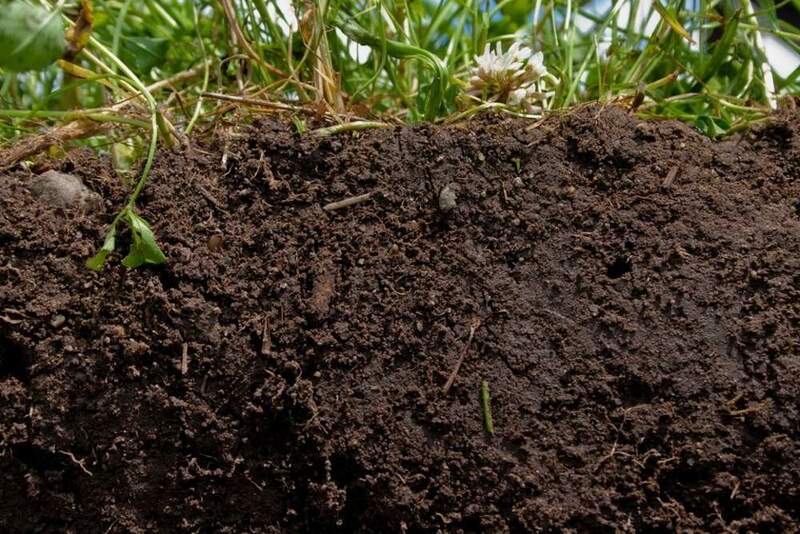 Older methods involved destroying the landscape through excavation of the earth, using heavy machinery to move polluted soil off site, and then capping the ground with new soil thus creating a “habitable” environment. It was a costly and destructive way to cleanse the ground, and then where does the polluted soil go? 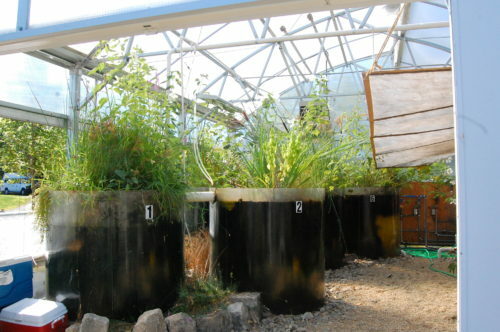 At the living systems laboratory in Grafton they are using the system John Todd calls the “Eco-Machine,” which reduces pollutants in the water through a biologically diverse and complex ecological process. First water moves through the “Bottom Filters,” which removes harmful pollutants through three cubic yards of anaerobic bacterial tubing. Second, the water is pumped into the greenhouse and through fungi containers called “Myco-Reacters.” These fungi break down hydrocarbons and pollutants (complex molecules) into simple compounds, allowing other species a chance to feed on the harmful pollutants. They are also studying the potential of certain fungi to transform the same harmful metals into harmless metals. Finally, after going through the fungi tubs, the water is led into six sequentially organized, 700-gallon algae tanks filled with microbes, plants, and animals. These tanks are filled with snails, shrimp like crustaceans, fish and plants producing an environment for anaerobic bio-microbial life. Plants like Typha latifolia or Bull Rush which have already been proven to help cleanse the water of harmful sediments and pollutants were included in the process. Other volunteer specimens like Lythrum salicaria Purple Loosestrife, which somehow found its way into the tanks have showed signs of also being beneficial to the cleaning process in addition to being ornamental. Finally after leaving the Eco-Machine the water is redistributed along the “Canal Restorer,” which is strategically positioned running linearly with the canal, holding a variety of native plants with well established root systems. 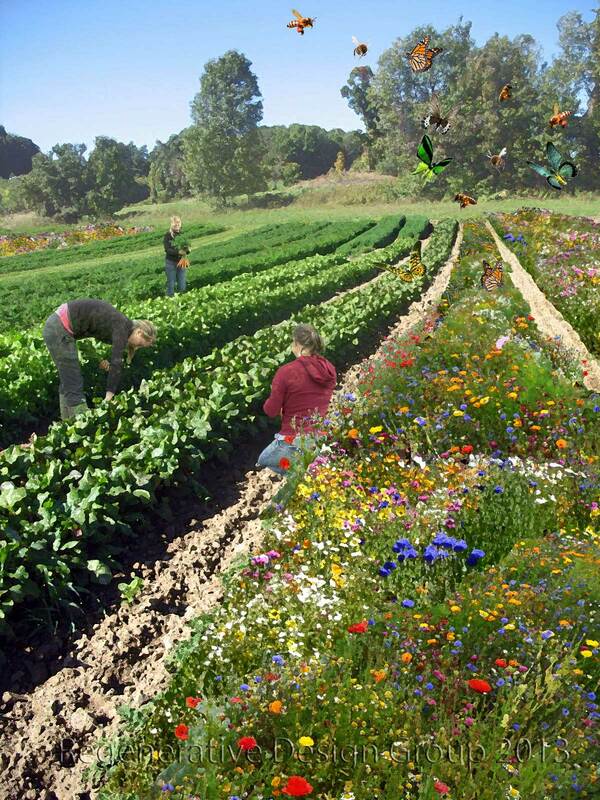 The idea is to one day evolve this entire system into becoming self-sustaining, and self-remediating one. 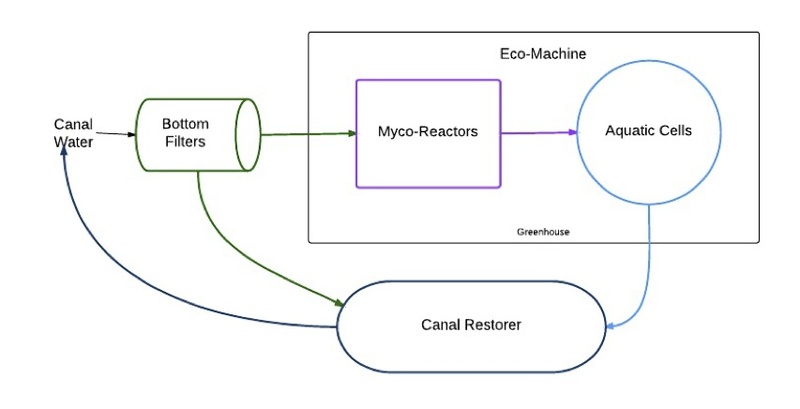 This will be done through reintroducing the bio-treated water into the Canal Restorer, which will act as a source for beneficial bacteria, improving the ability of the canal to bioremediate on its own. Eventually the Canal will rid itself of pollutants solely through biological means, with little to no human interaction whatsoever. The living systems laboratory is a bold endeavor,no doubt, yet remains one of the only designs of its kind, making it a part of the frontier for bioremediation technologies.